March 30, 2016 – The SETI Institute has inaugurated a greatly expanded hunt for deliberately produced radio signals that would indicate the presence of extraterrestrial intelligence. Over the course of the next two years, it will scrutinize the vicinities of 20,000 so-called red dwarf stars. This conservative assessment was bolstered by the argument that few planets were likely to be found in the habitable zone of a red dwarf star, simply because that zone is far narrower than for brighter stars like the Sun. Additionally, any worlds that were in this zone would be orbiting so close to their suns that they would quickly become tidally locked – with one hemisphere perpetually facing the star. It was assumed that this would produce a planet that was intolerably hot on one side, and brutally cold on the other, ruling it out as an abode for life. However, more recent research has indicated that, if these worlds have oceans and atmospheres, heat would be transported from the lit side to the dark, and a significant fraction of the planet would be habitable. In addition, exoplanet data have suggested that somewhere between one sixth and one half of red dwarf stars have planets in their habitable zones, a percentage comparable to, and possibly greater, than for Sun-like stars. Closer stars mean that any signals would be stronger. Also, red dwarfs burn for a period of time that’s greater than the current age of the universe: every red dwarf ever born is still shining today. They are, on average, billions of years older than Sun-like stars. 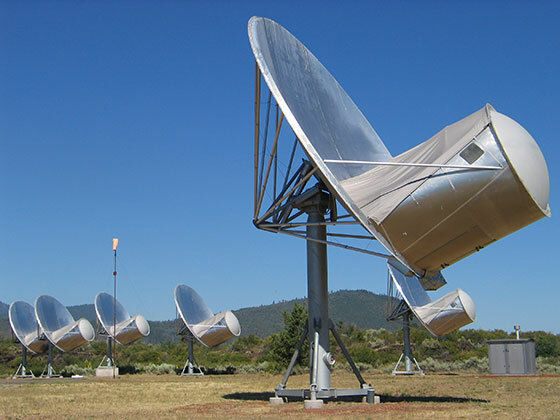 The search is being conducted on the SETI Institute’s Allen Telescope Array, located in the Cascade Mountains of northern California. This grouping of 42 antennas can currently observe three stars simultaneously. The new red dwarf survey is planned to take two years. Targets are being chosen from a list of approximately 70,000 red dwarfs compiled by Boston University astronomer Andrew West. The search will also incorporate relevant new data as generated by NASA’s TESS (Transiting Exoplanet Survey Satellite) project, which will examine nearby stars, including red dwarfs, for planets.